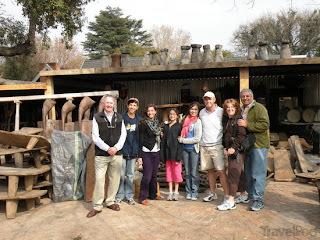 There is a really nifty website called www.joburg.org.za - It's the official website of the City of Johannesburg. Whilst browsing I came across this awesome list of some of the oldest, most interesting and virtually undiscovered shops in Joburg. Go and check out the full list here but I've put together a few of my favourites below...some I have been lucky to visit already...others not yet. But it's exciting to discover these hidden gems that have been right under our noses all along! Indulge your fancy for French and English-style antique furniture by popping into this store with its vast collection of beautifully crafted furniture. Owner Carmit Bamberger makes regular visits to Jepara in Indonesia where a thriving industry in this furniture takes place, supplying stores all over the world. “A lot of people can't afford the genuine antiques, but these reproductions are beautiful and affordable,” she says. Most items are fine mahogany, with a range of finishes and upholstery of your choice. 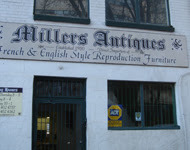 You'll find dressers, dining room tables of all sizes, mirrors, magnificent beds, settees, and a large selection of chairs. I havent been to Miller's yet, but drove past it the other day...looks very quaint and old-world. Are you big into brand shoes? If so, this is the shoe shop to visit. You'll find them all: Sissy Boy, Zoom, Rage, Launch Footwear, Bronz, 9 West, Guess, Converse, Supergo, Levi's, Soviets, Ellesse and Reebok. Two whole floors of them too. Owner Muhammad Bulbulia says the company has been around for some 30 years, in various inner city locations, and in Pritchard Street for the past 16 years. Around 65 percent of the shoes are women's shoes, the biggest market the store caters for. Most of the shoes are imported from China, with the Reeboks coming from Lesotho. 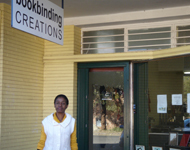 There is a second branch at 256 Bree Street. This is shoe heaven. If you ever need ostrich or turkey feathers, in any imaginable colour, this shop is the place to go. There're boxes and boxes of coloured feathers, and rows and rows of feather boas. And Ees will make them into any hat or headdress you desire. Ees owner Anton Ehrhartsmann (the surname was shortened to "Ees" when his father opened the shop in 1960) says they have just supplied the presidential guard of the Zambian army with their headgear. Another customer is the Lido in Paris. Export orders make up about a third of their business. Their African market is growing, with customers coming from Mozambique, Botswana and further afield. Ees also makes curtains - the biggest Roman blind in the world for the Cape Town Convention Centre. They also supply costume accessories - sequins, rhinestones, transfers and trims, and of course, rolls and rolls of lycra, printed and plain, for those costumes. A friend's mom took us to Ees when we were still in school. It was magical! Like a dress-up paradise! It was filled from floor to ceiling with theatre masks, feathers, sequins, hats and all kinds of exciting stuff...still determined to go back there one day. If you want your jaw to drop at the enormity of thousands of pieces of beautiful African artworks, take a trip to Bramley, and wander from room to room and out into the garden to marvel at the range of items. Outside there are magnificently carved crocodiles, fish and snakes from Swaziland, together with dug-out canoes from central Africa. Then walk inside, and you'll see items from every country in Africa - wall hangings, grass baskets, benches, headrests, tall painted figures, masks, horns, wooden antelope heads, bronze heads, and much, much more. Owner Mark Valentine says he sells around 300 items a day, with several people working all day wrapping and packaging these items. He has been selling African craft for 18 years at "good, honest" prices. Some of the artwork dates back to the 1930s, and he has craftspeople on the continent specifically producing stuff for him. He spends some 40 percent of the year travelling throughout Africa, and sends back the artwork in containers by sea. Go and get your special piece of Africa. Amatuli is one of the designer's best kept secrets...I've spent a lot of time here and love the fact that the items I choose can be customised and painted while I wait. Trade secret: they regularly supply Weylandts *wink*. Wanna lose yourself in up to two million books? Head into the CBD, ring the bell and wander around this store gobsmacked. There are books stacked everywhere, plus LP records, sheet music, maps, porcelain and postcards. One of the owners, Jonathan Klass, who has been in the business since 1974, says his parents were collectors and he grew up with 100 000 books around him. His family has never stopped collecting, and several floors of the eight-storey building the shop is in are filled with his collections. "We don't throw anything out," he says. You'll find books of every subject under the sun except for school textbooks and business management. He sells books on several websites too: abebooks.com and addall.com. Records are sold through gemm.com and musicstack.com. Go and get high on books. I havent been to the Collector's Treasury yet but am DYING TO GO! Looks amazing! Looking for something unusual for the home? 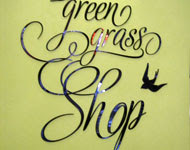 Try the delightful lazer-cut products in this shop, which opened in November 2010. Bowls, mirrors, coasters, mobiles, fridge magnets, side tables, place mats, book ends, desk organisers and more – are delicately cut from perspex, leather, wood, paper, cardboard, foam and suede. The paper, board and perspex are all recycled. Says owner Ria Kraftt, who is a graphic designer: "The products are original and fresh, we don't mass produce. I designed the products for my own needs, hopefully people have similar needs." Go take a look – you're sure to find you need something from this shop. Haven't been here either yet but lazer-cutting is a big thing at the moment so will probably find myself there soon. la Basse-cour, 44 Stanley Avenue, Milpark, 011 482 2707, Fridays 9am-5pm, Saturdays 9am-4pm, Sundays 10am-3pm If you long to fill your home with period furniture and homeware, head off to this showroom and immerse yourself in French provençal splendour. Owner Robert Desfontaines imports all his wares from France and he's very happy being tucked away in this trendy enclave in Milpark. You'll find furniture from city and town to farm kitchen and stoep, which includes architectural antiques, religious artefacts, antique lighting, and much more. Go along and browse among the chandeliers, large gilded mirrors, cast iron and wrought iron items, antique doors, gates and screens, and porcelain. I'd be very surprised if you can resist taking home at least one item. Want to immerse yourself in quality silks, crepes, and georgettes? Want to step back into the Victorian, Edwardian, or the 1920s' fashion scene, and go home with a unique piece of clothing? 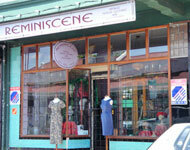 Then visit Reminiscene. Owner Rosemary French says all the items in her store date from before the 1960s. She specialises in beautiful handbags and antique jewellery but has dresses, blouses, suits, hats, shoes, and furs – from Russian mink to Canadian squirrel, and red, grey and white foxes. For men there are quality tuxedos, tails, scarves, bowties and cufflinks. "The quality of the fabrics cannot be imitated today," she says. Jewellery ranges from silver, gold, onyx, garnets and rubies to peridots, amethysts, sapphires and emeralds. It's another world which promises a glimpse into bygone eras, with a chance to own something you'll treasure forever. 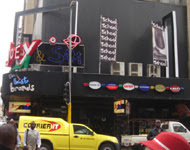 This shop has been in Melville FOREVER. I'm sure most of us have browsed there during our student forays into 'Old Melville'. Got books at home that are badly in need of repair? Well, stop in at Bookbinding Creations and get your book back in a few days looking almost new, and without a huge hole in your wallet. Entrepreneur Virginia Ngwenya bought the business in 2008 where she was previously an employee, and hasn't looked back since. She binds around 300 books, journals, theses, and photograph albums each month, all with a friendly smile. For a totally different sensory experience and a look at an Africa unknown to some, take a trip downtown to the Museum of Man and Science in Diagonal Street. The 66-year-old museum (why it was originally called a museum seems lost in time) is a traditional muti or medicine shop, described on the board above the door as the "The King of Muti, Herbal and Homeopathic Remedies". There're over 1 900 dried herbs in the shop, prescribed by inyangas or traditional healers. There're a lot of interesting things to buy: tyre sandals, walking sticks, assegais, knobkerries, bead necklaces, Zulu pots and drums. You can make an appointment with a sangoma, who will throw the bones for you, and give you valuable advice. But even if you don't buy anything, it's just a wonderful experience, with a myriad of different sights and smells. One of Johannesburg's original shops - 109 years old - A Portas offers great phyllo pastry and parma ham. But what's really unusual is that it doubles as a model train shop so while you sip your coffee, expect to overhear animated conversations about the latest model trains, railway bridges and dioramas. A Portas was started in 1896 by the owner George Lagoudis' great uncle. 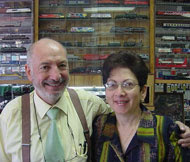 When train enthusiast Lagoudis took over in 1970, he expanded the shop to include The Shunting Yard, with shelves and shelves of model trains and associated paraphernalia. With his wife Areti, Lagoudis has created an ambience conducive to a good cup of coffee, stimulating chat and either a purchase of great deli or great trains. Even if trains aren't your thing, ask for a demonstration anyway, and be intrigued by the sounds of the miniature trains puffing along the track, the shovelling of coal and the hiss of the brakes. It's a philosophy of "it's nice being alive," says George. Any shop that has lasted for 109 years has got to be worth a visit! Wow! As I said, the above are just a handful of the interesting jobs hidden away in Joburg. It's totally worth checking out the rest of them here.